October 4, 2017 / Washington Heights Neighborhood / Sports & Parks Manhattan / Manhattan Buzz NYC. 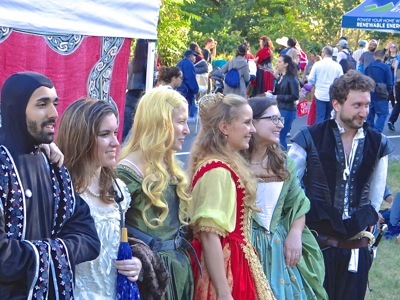 On Sunday, October 1st, I headed up to Washington Heights to attend the 35th annual Medieval Festival at Fort Tryon Park. It was a beautiful fall day as I rode the A train north from Times Square. I met a beautiful young princess from the Bronx on the train wearing a Medieval headband of flowers in her hair. We started talking about the Medieval Festival and lucky for me she had attended it previously and gave me a few important tips. The first tip was to get off the train at the 190th Street stop because Fort Tryon Park is situated on a bluff [the forts always were so they could spot trouble ahead] and the 190th Street subway station is equipped with elevators which take you up to the park level which overlooks the rest of Washington Heights. She also drew my attention to the jousting contest which was to begin at 5 pm. When I arrived at the top of the hill, I began my journey through the Medieval Festival which included numerous ye olde vendors selling food and clothing and gifts, as well as all sorts of other things including beauty items. But what was most peculiar were the various acts and events going on all along my walk north to the Cloisters. 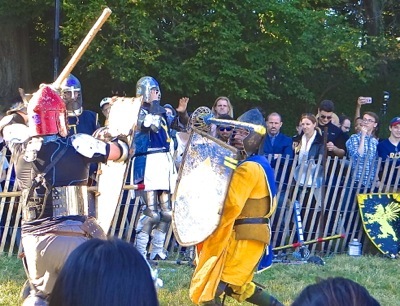 Click here for additional photos and a video of the jousting contest, as well as a brief history of the Medieval Festival, the Cloisters and Fort Tryon Park. 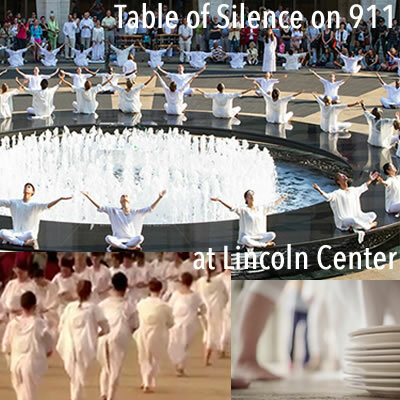 September 11, 2017 / Upper West Side Neighborhood / Modern Dance Manhattan / Manhattan Buzz NYC. Is Singing Beach a Twilight Parallax? July 25, 2017 / SoHo Neighborhood near Tribeca / Manhattan Theater & Summer Plays / Manhattan Buzz NYC. Last Thursday I had the opportunity to watch the dress rehearsal of Singing Beach written by American playwright Tina Howe. Tina Howe has won numerous awards and honors as an American Playwright including placing as a finalist for the Pulitzer Prize in Drama in 1983 [Painting Churches], the Drama Critic's Circle Award for Best Play in 1998 [Prides Crossing] and the Lilly Award Lifetime Achievement Award in 2012. Tina told me that the play, Singing Beach, was something she had started nearly a decade ago, but had put on hiatus after a couple of years of toil because she just couldn’t get it right ... until now. 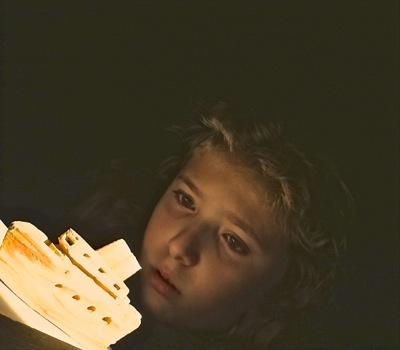 In the photo at right we watch as granddaughter Piper, played by Elodie Lucinda Morss, segues into another dimension taking us aboard the S.S. United States in Singing Beach, a new play by Tina Howe. 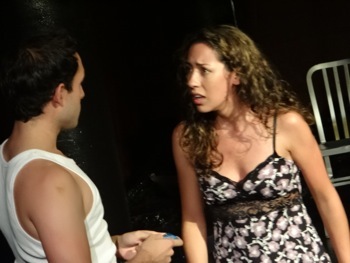 The play, Singing Beach, explores a number of themes. One of them is how family members respond to the caring needs of an aging, non-functional family member. In the Singing Beach play, the near-comatose elder is the father of the mother character [Mary], and the grandfather of granddaughter character [Piper] – whom together represent the female axis around which the play revolves. In a more cosmic parallax sense, the play actually encompasses three generations of women, as the grandmother’s presence is felt by the void left when she passed away a year earlier. 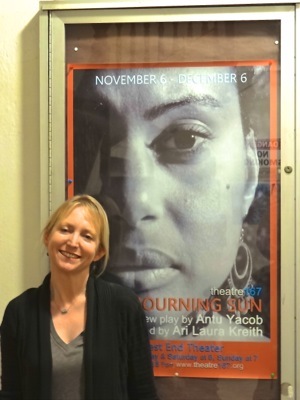 Tina Howe’s new play is directed by Ari Laura Kreith of Theatre 167 and produced by Jenny Lyn Bader. The play opens on a beautiful beach, Singing Beach, which is a reference to a small, exclusive half-mile stretch of beach near Manchester by the Sea, which is just north of Salem in Massachusetts. The beach is known for its unique sand, which periodically emits sounds, when the wind hits the beach sand in just the right way. The ghostly sounds of Singing Beach appear to be a metaphor in the play. Shortly after the play opens, we’re told there’s a storm, with potentially lethal gale force winds approaching. Will the storm wreak havoc, misery and by virtue of its destructive force, shake up and change everyone’s reality? Shortly after the first scene, we’re taken into the dreamy parallax stream of subconscious in granddaughter Piper’s mind - in a transition that is far more subtle than the windy transition taken by Dorothy in the Wizard of Oz. After Piper takes us aboard a transatlantic steamer, she appears to have far more fun than Dorothy, but is traveling in an environment that might be more mortally dangerous. 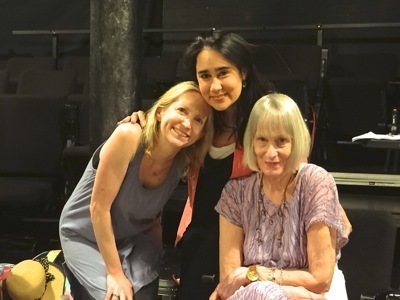 In the photo at right are Director Ari Laura Kreith, Producer Jenny Lynn Bader and Playwright Tina Howe at the Here Theater in SoHo. I’ll have more on this as the week progresses, but in the meantime Singing Beach is being performed at the Here MainStage Theater at 145 6th Avenue at Dominick Street in SoHo. The play runs through August 12, 2017, but seating is very limited. August 18, 2018 / Manhattan Neighborhoods / Manhattan Theater Theatre District / Manhattan Things To Do / Manhattan Buzz NYC. 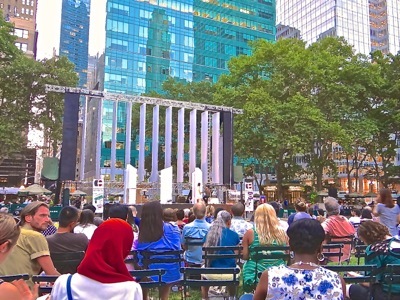 Click here to view a listing of the dates and times of free things to do in Manhattan - free theater in Manhattan parks. May 30, 2017 / East Village Neighborhood / Theater in Manhattan / Manhattan Buzz NYC. 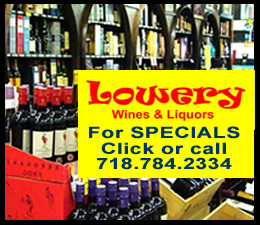 I attended the 22nd annual Lower East Arts Festival in the East Village this weekend. It was held at the Theater for the New City on First Avenue off 10th Street. As I approached the theater, I could see it was bustling. Inside there was a long winding hallway, with high ceilings, and art exhbits adorning the walls and crannies along its length. I stopped at the ticket booth to get a bit of orientation and here's what I learned. The festival was started by an actress, who was prepping, performing and managing the whole time I was there, so I didn't get a chance to speak to her on this visit. At right you can see the audience attentively watching a musical performance in the lower theater of the Theater for the New City. The Theater for the New City predates the festival, when it went by another name. The festival itself was first held in the West Village, then moved farther east, and a few years ago opened up at this location. 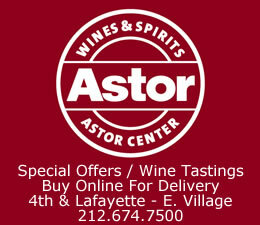 The festival celebrates the artistic community of the Village, Manhattan, and the greater NYC metropolitan area. There are literally dozens of performances and exhibited artworks, done by and featuring in the neighborhood of well in excess of 100 participants. 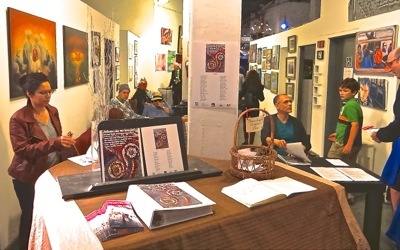 In the photo at right you can see some of the art exhibited at the 22nd Annual Lower East Side Festival of the Arts in the East Village in Manhattan. The festival theme this year was 'We are all Immigrants'. All events are free, the festival lasted three days, and the Theater for the New City is, as I was told, in a constant state of movement, so there will be more to come. October 16, 2016 / Manhattan Neighborhoods / Holidays in NYC / Manhattan Buzz NYC. 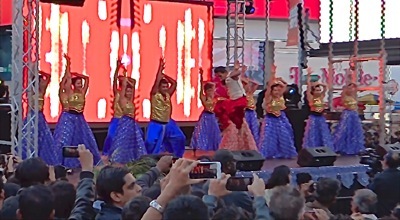 I attended the third annual Diwali Festival in Times Square on Sunday. The day long event, celebrating the millenia old Indian festival, had started in the afternoon at 2 pm and ran well into the evening, ending at 9 pm. As I came up from the subway I asked an Indian-looking NYC policman to point me in the direction of the festival. He asked me how I had heard of the event and I mentioned that I had found out about it on Manhattan Buzz, but that I had also traveled to India some time ago where I first became aware of the Indian holiday. He inquired as to where I had traveled in India, which was mostly in the north, and he suggested the next time I visit, to check out Kerala, which is where his family is from originally. I had learned from my travels that Kerala is a southwestern Indian province along the Indian Ocean, and is said to be a bit of paradise. A large crowd had gathered to watch the festival, many of whom were of Indian descent which I found from conversing with several of them. They brought their families to view the free entertainment which included a number of wide ranging song and dance performances by dance troupes and musicians. Diwali is the festival of lights, which commemorates light overcoming darkness, good overcoming evil and knowledge overcoming ignorance and hope defeating despair. It is one of the three major Hindu festivals and a time for renewal and celebration which is denoted by the cleaning of homes and the lighting of lights. The Diwali Holiday officially runs from October 30th to November 3rd, but unoffically it lasts longer starting in September / October and ending in October / November. The other two major Hindu holidays are Holi which celebrates Spring with the coloring of people's bodies, faces and hair and Maha Shivaratri which is one of the rare nighttime celebrations, held just before the arrival of Spring with a mix of solemn practices including meditation, yoga and fasting. Happy Holidays or as they say in Hindu - छुट्टियों की शुभकामनाएं. March 7, 2016 / Manhattan NYC / Off Broadway Theater NYC / Manhattan Buzz NYC. The Midtown International Theater Festival begins this week and the Short Play Lab begin this weekend. These two incubator theater festivals are the brainchild of John Chatterton, former Publisher of Off Off Broadway World magazine. Off Off Broadway World magazine was started by Chatterton in 1993, and was published for a number of years in the 1990’s, but ultimately didn't survive. Founder, John Chatterton did survive, and he went on to pursue his passion for theater by founding the Midtown International Theater Festival and the Short Play Lab series. The two theatrical incubators provide a venue for participants to create and produce minimalist performance productions and perform them in front of live audiences, which are oftentimes comprised of many of their fellow participants and peers, as well as those interested in original theatrical works. 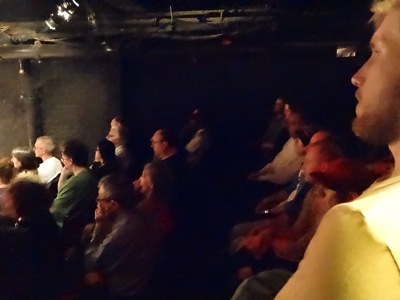 The Midtown International Theater Festival and Short Play Lab series are both an opportunity to try one’s hand at producing and performing an original work in front of a live audience, as well as a good networking venue to meet others aspiring to find their places in the theater business. Click here for the full story about the Midtown International Theater Festival & Short Play Lab series both of which begins this week and weekend, respectively. December 12, 2015 / Upper East Side Neighborhood / Manhattan Dance & Theater NYC / Gotham Buzz. But that said I’ll give it a try. And if not successful, you'll get a second chance as I captured some of the performance on video. And given that a picture says a thousand words, then video must be good for at least as many words. It was a near balmy evening as I made my way to the Kaye Theater on 68th Street between Park and Lex on the Upper East Side. The Yorkville Nutcracker was to begin at 7 pm and I arrived with just enough time to pick up my ticket and make my way up to the balcony. The Kaye Theater is fairly spacious theater (in as far as Manhattan theaters go) and well kept, seating well over 500 people for each performance. It wasn’t long before the lights dimmed, and the curtain rose, and the performance of The Yorkville Nutcracker at the Kaye Theater on the Upper East Side began. November 16, 2015 / Upper West Side Neighborhood / Manhattan Off Broadway Theater NYC / Manhattan Buzz NYC. I disembarked from the subway at West 86th Street on the Upper West Side. It was a relatively warm November evening as I got my bearings before heading west to the West End Theatre at 263 West 86th Street. West End Theatre is not just the name of the locale, but it’s also a phrase taken from the London theatre district, that is similar in essence, to what Broadway means in New York City. A West End Theatre production in London means you’re attending one of the highest level of commercially produced shows. So the West End Theatre is a ‘play’ on words - but appropriate here - as in addition to the name of the theater it also communicates the quality of the new play entitled ‘Mourning Sun’. The West End Theatre is located on the second floor of St. Paul & St. Andrew Methodist Church. The church is a large building, which was erected in 1897, at a time when the Upper West Side was being developed in great earnest. I walked into the building, which had a spacious ambiance. I was directed to walk up the wide, worn, white marble steps that led up the antique wooden staircase to the second floor. There’s a karmic feel to the place that allows one to breathe freely, not knowing whether it’s attributable to an ancient, ample, allowance for space; or because its inhabitants’ free flowing energy silently and insidiously infects its welcomed wandering guests with their buoyant enjoyment of life. I met Director Ari Laura Kreith and Jenny Lyn Bader upon my arrival. After a brief exchange of pleasantries I was escorted to the balcony where I had a box seat overlooking the stage so I could take photographs without disturbing the theater-goers. It wasn’t long before Director Kreith came on stage to introduce the production, and after speaking a few short sentences, she let the show go on. Director Kreith is shown in the photos above. Click here to read the rest of our report including a photo slide show of Mourning Sun, and off Broadway theater nyc produced by Theatre 167. 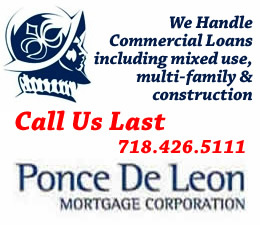 July 20, 2015 / Upper West Side UWS Neighborhood & Midtown Manhattan Neighborhood / Manhattan Dance / Manhattan Buzz NYC. Last year I stumbled upon the Check It Dance Festival on the Upper West Side of Manhattan. The festival was performed at Summit Rock in Central Park. Summit Rock is hidden behind the greenery that one encounters when entering Central Park at West 82nd Street and Central Park West. It was an idyllic location for the festival and both the dancers and the audience were surrounded by nature, surrounded by the dense concrete urban jungle. I sat for a while and enjoyed the performances which were a mix of aesthetic human form and beauty, and storytelling. This year the Check It Dance Festival moved south to Solar One along the East River, just east of Stuyvesant Town. The cool openess of the East River helps mitigate the heat, which on Sunday was in the low 90's. The festival included pieces created by eleven choreographers and in which over 40 dancers performed. This year they held the performance on Sunday due to inclement weather earlier on Saturday, as there were predictions of more inclement weather to come. Since its inception, the Check It Dance Festival has showcased local dancers and choreographers, as well as visiting choreographers from the Netherlands and Dominican Republic. I had an opportunity to speak with Allison Brzezinski, Founder and Artistic Director of Check It Dance Company. Allison is originally from Connecticut and holds a degree in both dance and theatre from Muhlenberg College in Allentown, Pennsylvania. "... crack the stereotypical infrastructure of how women are seen in society today, by creating new works that seek to empower women ..."
One of the premier choreographed works that have come from Check It Dance is entitled, Is My Body?. Allison told me that this work is about taking care of a woman's body in a healthy way, instead of trying to attain the ideal of female beauty that is depicted in the media but that doesn't exist in reality. The work was a collaboration between Allison & Kendra Dushac who performed it at the Fringe Festival in Edinburgh, Scotland; as well as at several locations in the NYC metropolitan area. 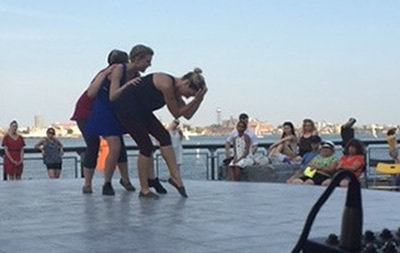 The photo to your right shows the Check It Dance Festival at Solar One along the East River in Manhattan in 2015. The photo was taken by Allison Brzezinski. To learn more about Check It Dance and future events, visit their website at www.checkitdance.com [cut & paste into your browser]. 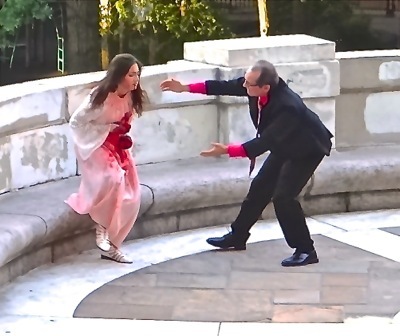 May 11, 2015 / Midtown West Neighborhood / Manhattan Theater / Manhattan Buzz NYC. I was treated to a rare pleasure this past weekend. I attended the opening performance of a play that was funny and engaging without enraging. It was written and performed in verse, but it wasn't at all terse. It was in some small measure, a modern Shakespearean pleasure, like Shakespeare’s more poetic works with modern themes and quirks. So we travel into this story together, I’ll treat you to some of the verse-like pleasure, but be advised that I was hypnotized and the verse was spoken more quickly than I was able to accurately capture it. Our story begins in the office of the Publisher of an In Flight Magazine sometime near 2015. As it’s set in the 21st century, the themes we encounter are all very modern. It begins with the Publisher, Marti – short for Martinelli, who is interviewing job applicants for a couple of travelogue reporter positions. What could be better than having a job where you get to travel to exotic places on the company dime and all you have to do is write about it? One of the applicants is a handsome young man, whose writing background is that of a novelist. His name is Andrew, and he’s not just handsome but also well read and an artful conversationalist, so Marti does a bit more than hire him. 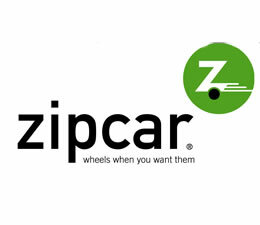 The next applicant is exactly the kind of reporter that Marti had hoped to find and hire, but just prior to the interview she is told by the Owner of In Flight Magazine [which is owned by Omega Airline] that her son Ted will be interviewing for one of the open reporter positions. So, Marti promises the perfect applicant that she’ll get back to her soon ... yeah. Ted, the Owner’s son, is also handsome, but a bit hapless having been looked out for by his overachieving mother. He’s not a great writer, but rather a list maker. He captures and catalogues everything. And much to our surprise … he’ gets the second and last open reporter position. But Ted's issues with his mother enter the workplace, and to Marti's advantage. The entire story takes place in Marti’s office. 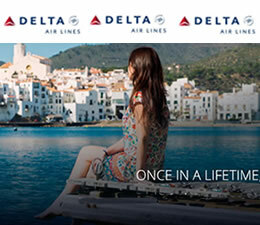 You see, for a travel publisher, Marti isn’t much of an adventurer herself, but rather lives vicariously through the work of the reporters she sends off to distant lands with the objective of capturing and then telling tales that will make people want to hop on an Omega Airline plane in pursuit of romance and excitement. In Flight is playing at The Workshop Theater on W. 36th Street in Midtown until May 23rd [tickets $18 - daily performances - 1.800.838.3006 or online at www.ttfinflight.bpt.me]. September 16, 2014 / West Village Neighborhood / Off Broadway Theater NYC / Manhattan Buzz NYC. I arrived at the New Ohio Theatre in the west village of NYC. The theater is accessible at the ground level of a modern building at 154 Christopher Street near the Hudson River. The actors and production staff were ready to begin one of their last rehearsals before the opening of I Like To Be Here: Jackson Heights Revisited, or, This Is A Mango. The lights dimmed, the theater darkened … and the show began. There we were … in the middle of Jackson Heights … late at night. There was a Latino girl of the streets talking to a cleaning woman of one of the local late night shops. The Latino girl was talking about escaping her current situation with one of the men who ‘loves’ her. She was young and somewhat innocent to the deceptions of the older men who came to see her. The cleaning woman and she talked about relationships and love. The cleaning woman was the target of the affections of an Indian man who seemed to take an interest in her. But they spoke different languages. 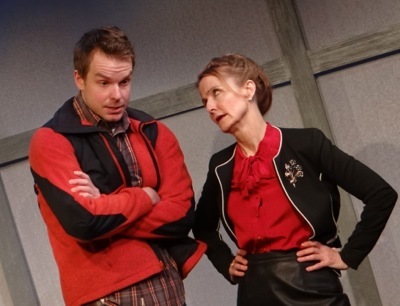 Click here to read the rest of our review of a new off Broadway show at the Ohio Theatre in the west village which is part of the theater: village festival. August 17, 2014 / Manhattan Theater NYC / East Village NYC / Manhattan Buzz NYC. The three week long Fringe Festival continues through this coming weekend. The Fringe Festival is a curated performing arts festival that includes music, dance and theater performances at various venues throughout various sections of the Village in Manhattan. I attended one such performance on Norfolk Street this past Sunday where the stage was fastened alongside a large box truck which was parked in a parking / play lot that was furnished with lawn chairs which were placed under a canopy to shelter the audience from the sun or inclement weather. All of the works are original and the mix provides an adventurous dive into the performing arts. We hear that some of the works should receive accolades while others are said to need a bit of work. But all in all attending the Fringe Festival in NYC makes for a fun afternoon or evening; and the ticket prices range from $0 to $18. For more info about what's playing the rest of this week and weekend, check out FringeNYC.org. We'll post more info and a photo slide show at a later date. July 20, 2014 / Upper West Side Neighborhood / Manhattan Buzz NYC. I went to Summit Rock in Central Park late Saturday afternoon to watch several performances of the Check Us Out Dance Festival in Manhattan. This is the fourth year of the festival which is organized by ChEckiTDance of Manhattan. The weather and locale were ideal. It was sunny, in the seventies and not humid. And Summit Rock is at about 83rd Street just inside the stone wall surrounding Central Park [enter at 81st and follow the pathways along the wall to your left up / north] in an elevated, generally shaded and secluded setting. There was easy seating along a wall facing a stone stage with a green grass backdrop. And when I arrived one of the performances was already in session with dancers in costume accompanied by live music. We'll post more at a later date including a photo slide show. 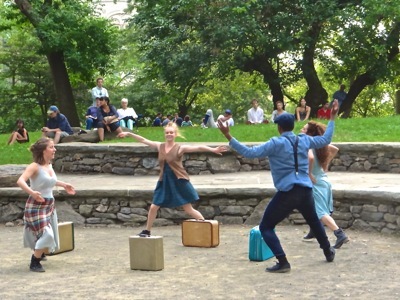 The photo above was taken of one of the dance performances at ChEckiTDance Festival in Central Park on July 20th. 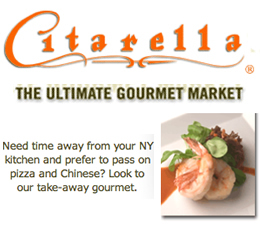 May 26, 2014 / Theatre District Neighborhood / Manhattan Things To Do / Manhattan Buzz NYC. I had an opportunity to preview an original theatrical work entitled They Call Me Q. The play opens at St. Luke’s Theatre in Midtown on June 4th. The play is about an immigrant Indian woman’s personal journey in search of finding comfort in her own identity which encompasses both Indian and American cultures. She was born in India and spent her youth there [until age 13], before coming to America with her parents at a tender adolescent age. She arrived on these shores as a complete stranger in a strange land. Her parents settled into the Bronx and she began attending American public school. The show provides a unique opportunity to peer inside the life of a first generation 21st century immigrant American. Q delves the depths of her emotional struggle to find peace with herself as the embodiment of the cultural crossroads of ancient traditions, living in a modern, urban, American borough called the Bronx. Click here to read our review of They Call Me Q at St. Lukes Theatre NYC. May 19, 2014 / East Village NYC / Things To Do Manhattan / Manhattan Buzz NYC. I attended the Dance Parade in NYC. It's an event that started in response to some old laws on the books prohibiting certain kinds of behaviors that could encompass dance performances. Laws of a bygone era. 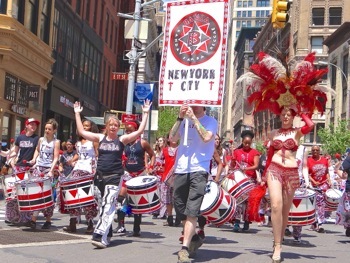 There were thousands lining the streets of the parade route which began in the Flatiron District, moving south along Broadway through the heart of the Village before turning east into the East Village and terminating at Tompkins Square Park. Performances followed at Tompkins Square Park. In the photo at right you can see a dance group as they march along Broadway not far from Union Square Park. We have a slew of photos of this visual feast which we'll post at a later date. May 2017 / Manhattan Neighborhoods / Manhattan Things To Do / Manhattan Buzz NYC. This section provides an overview of some of the theatres / theaters in Manhattan. All of these theatres / theaters host theatrical productions in Manhattan. Click here to view our listing of Manhattan Theatres Theaters in NYC.